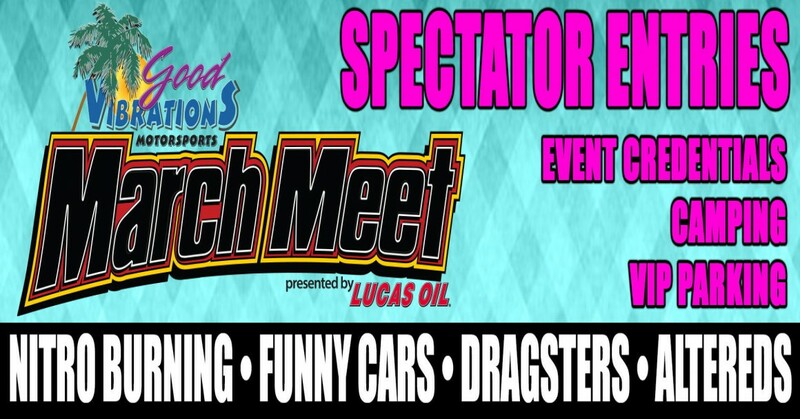 Spectator - Camping - Car ShowTickets for the World famous 2019 Good Vibrations Motorsports March Meet presented by Lucas Oil at Auto Club Famoso Raceway. Celebrating 61 years of quarter mile drag racing. Event credentials get you in starting on Tuesday when the Camping gates open and Vendors and Racers start to park. ONLY Full Event Credential holders will get to Experience 5 full days of Drag Racing. Take this time to explore the hallowed grounds of one of the World's most historic Race Tracks. Watch the racers as they transform the empty pits into a small city of race cars. Beat the crowds with early access to your favorite vendors and the goodies they have to offer.